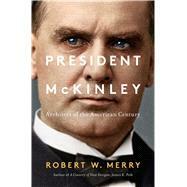 In this great American story, acclaimed historian Robert Merry resurrects the presidential reputation of William McKinley, which loses out to the brilliant and flamboyant Theodore Roosevelt who succeeded him after his assassination. He portrays McKinley as a chief executive of consequence whose low place in the presidential rankings does not reflect his enduring accomplishments and the stamp he put on the country’s future role in the world. Republican President William McKinley in his two terms as president (1897 – 1901) transformed America. He established the US as an imperial power. Although he does not register large in either public memory or in historians’ rankings, in this revealing account, Robert W. Merry unfolds the mystery of how this bland man managed so much powerful change. McKinley settled decades of monetary controversy by taking the country to a strict gold standard; in the Spanish-American war he kicked Spain out of the Caribbean and liberated Cuba from Spain; in the Pacific he acquired Hawaii and the Philippines through war and diplomacy; he developed the doctrine of “fair trade”; forced the “Open Door” to China; forged our “special relationship” with Great Britain. In short, he established the non-colonial imperialism that took America into global preeminence. He expanded executive power and managed public opinion through his quiet manipulation of the press. McKinley paved the way for the bold and flamboyant leadership of his famous successor, Teddy Roosevelt, who built on his accomplishments (and got credit for them). Merry writes movingly about McKinley’s admirable personal life, from his simple Midwestern upbringing to his Civil War heroism to his brave comportment just moments before his death by assassination (it was only six months into his second term when he was shot). Lively, definitive, and eye-opening, President McKinley resurrects this overlooked president and places him squarely on the list of one of the most important.